The emphasis is on relaxation and discovery, there are many other things to entertain you, but do not expect wind surfing and jet skis, this is Amorgos not Corfu. The sea here is some of the clearest water in the world so the swimming and snorkelling is fantastic. There are a few hire cars available and we can also arrange a minibus tour of the island for you. We have a high speed boat available that we can use to whizz you out to uninhabited islands for the day if you feel that even life on Amorgos is too much for you. Barbecues and picnics can also be arranged through us. More adventurous clients may wish to go diving with the PADI licenced dive centre in Ormos or climb the cliffs behind the hotel on the professionally located climbing routes. Equipment is supplied for both of these activities. Yoga and Tai Chi courses are available. 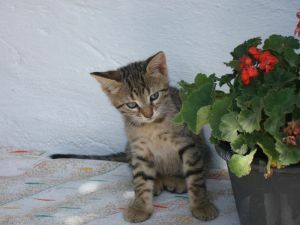 If you have overdone the walking or climbing, a massage can also be arranged (for more info visit IRIS Amorgos). Once a week in the summer our resident astro-physicist runs astronomy courses. These have been very popular with our clients. If you want to get into the mountains without walking we can arrange escorted donkey tours for you. 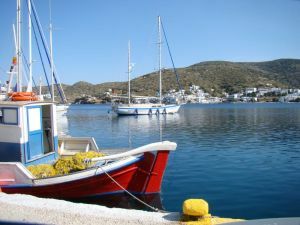 On calm days (or choppy for those who are so inclined) you can take our local small ship on a tour of The Small Cyclades and spend a few hours on Naxos. You could also visit the hotel’s organic farm and see where much of the restaurant supplies come from. 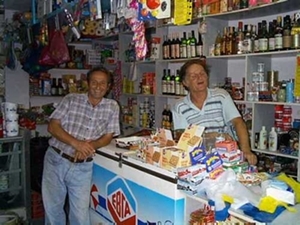 You cannot exactly go on a shopping spree on Amorgos but a visit to one of the few delightfully chaotic shops is well worth while. They are amazingly well stocked with everything from olive oil to Christmas Crackers (yes even in the summer) and local wine to phone cards. There are also a few gift shops. Next to the hotel is a natural herb centre. Here they can give you advise on the use of all the local herbs and oils they have available. If you wish to spend the day on the beach in Ormos Aegialis there are a fair number of establishments to choose from for lunch. There are traditional tavernas where you can watch the local fishermen playing tavli (a version of backgammon) or cards. Don’t worry about the verbal abuse they throw at each other, they are actually friends. It is advisable however to avoid joining in with either the game or the abuse! For a quieter life discover the few beach bars and restaurants along the front where, after lunch, you can lie back and doze in upholstered chairs or hammocks. From the Amorgos Weather link on the left menu bar you can check on the weather today and also get an idea of the seasonal changes. 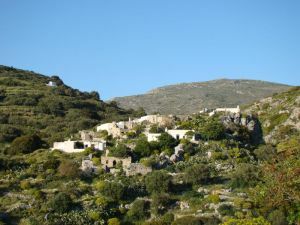 The area around Amorgos is unique in the Aegean. It is unlike Crete to the south, the Mainland to the West and Rhodes and Turkey to the East. From May through to October rainfall is practically unknown on the island. However, the high mountains sometime result in a little cloud in the mornings; this gives us ideal walking conditions. Also in the summer the northerly meltemi wind blows which also helps to keep us cool, particularly up on the tracks in the mountains. 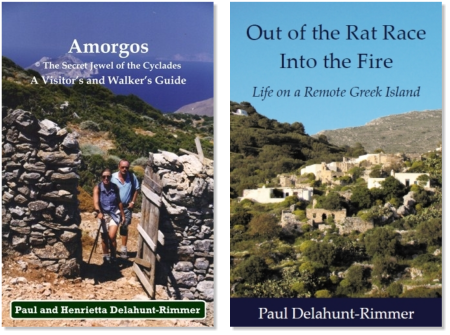 If you go walking with Henri Delahunt-Rimmer she will talk to you about the history of the island and point out to you many remains from the 5th century BC. As a professional historian she has been researching the history of the island since 1994. However there is much still to be discovered. Along with our course archaeologist, Dr Graham George, our company has identified sites dating back six thousand years that are uncharted. Due to strict regulations in Greece governing ancient sites these cannot be disturbed but on free days on self guided walks you may discover more. We can point you in the right direction but stress that nothing should be touched or removed. If you know where to look the whole island is rich with history. Buildings, churches and farmland on closer inspection reveal the secrets of the islanders centuries ago, many traditions of which still remain. The more intrepid clients may wish to go snorkelling by the uninhabited island of Nikuria and discover the underwater city and see many ancient pots and jars. You may even come across some coins from the mint that used to be there.